Last in the series, funs over for now. Enjoyable book with all the humour and brutality expected if David Wood. 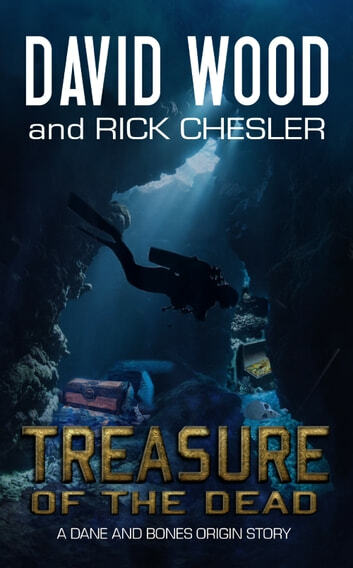 If you're a fan of Clive Cussler you'll like what this author has to offer. *I was given this review copy audiobook at my request and have voluntarily left this review. In 1715 a ship full of treasure has been pushed off course with terrible storms. El Senor San Miguel runs onto land. When one of the crew makes land, he is horrified by what he finds limping on the beach. Bones agrees to go on treasure hunting in the vast ocean with Maddock and has the first spot in mind. Bones had received a call from a dear friend of his when she received information from a cousin that's been found dead, mauled by animals. 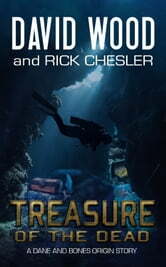 Maddock and Bones will quickly learn that trouble follows them whether in the service or on their own hunting treasure. Jeffrey has voiced all the stories in this world with these men, and he is with us again. Jeffrey has become the voice of Maddock and Bones and all friends they interact with. The best part, I feel as the personality and tone given to Maddock and Bones fit the people written in words. For some reason Bones feels natural, but he's probably my favorite of the two. lol. Jeffrey never gives away a feel that something is coming, he adds just enough tension to the story by keeping in the here and now. This leaves me feeling comfortable with the characters but knowing with the writing of David and Rick that something is coming, I'm just waiting for it. In the beginning we see a glimpse of a different side of Maddock and Bones. They left SEAL just months ago, and both are struggling adjusting to civilian life. Bones seems to be worse in a different way than Maddock, needing a release for pent up frustration. I like seeing them struggle after their life has been SEAL for so long. The life they lived is completely different than how they are to live now. Maddock shows up to ask Bones to help on a treasure hunting expedition, something they know how to do but less dangerous for their lives. These two never lose their great humor that makes me smile even in the tough times. This is a slower start in the way of action for Maddock and Bones. But the authors strategically write in sections, as they are known for, with other characters. The events of the other characters then lead to our guys arriving, and things don't go as smoothly as it should, which could be to Bones and Maddock's liking. Well, maybe just Bones. They do enjoy their danger. We see Bones flirting, as usual but with someone that he has some past with. The friend that contacted Bones is/was more than a simple friend. She and Bones have history together. I always enjoy getting to spend any hour with Maddock and Bones. Their banter always brings a smile to my face while their adventures make my heart race. I enjoy the twist to the history that's created, a twist with a slight paranormal feel to it, as we go on the expedition not knowing what we'll walk into yet knowing it's going to result in danger and action. This book is shorter in length, as audio it's just shy of 5 hours. The authors keep the story to the point of action, where we learn details of what we are looking for which leads eventually to troubles for our guys. We don't waste time getting from one point to the next as long as there is nothing extraordinary happening. When things start to come out in the end, it all happens fast. Maybe a bit to fast, but that's the way it washes out in the end - all at once. Full of action as always with David Wood's books. Great story - a good read from page 1.